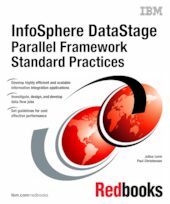 In this IBM® Redbooks® publication, we present guidelines for the development of highly efficient and scalable information integration applications with InfoSphere™ DataStage® (DS) parallel jobs. InfoSphere DataStage is at the core of IBM Information Server, providing components that yield a high degree of freedom. For any particular problem there might be multiple solutions, which tend to be influenced by personal preferences, background, and previous experience. All too often, those solutions yield less than optimal, and non-scalable, implementations. This book includes a comprehensive detailed description of the components available, and descriptions on how to use them to obtain scalable and efficient solutions, for both batch and real-time scenarios. The advice provided in this document is the result of the combined proven experience from a number of expert practitioners in the field of high performance information integration, evolved over several years. This book is intended for IT architects, Information Management specialists, and Information Integration specialists responsible for delivering cost-effective IBM InfoSphere DataStage performance on all platforms.